NASA is holding a news conference tomorrow (Feb. 22) to discuss "new findings on planets that orbit stars other than our sun, known as exoplanets," according to a statement from the agency. The news conference begins at 1 p.m. EST (1800 GMT). No other specifics about the "new findings" have been made public, but "details … are embargoed by the journal Nature" until 1 p.m. EST, according to the statement. The news conference will feature five speakers: Thomas Zurbuchen, associate administrator of the Science Mission Directorate at NASA headquarters; Michaël Gillon, astronomer at the University of Liège in Belgium; Sean Carey, manager of NASA's Spitzer Science Center at Caltech/IPAC in Pasadena; Nikole Lewis, astronomer at the Space Telescope Science Institute in Baltimore; and Sara Seager, professor of planetary science and physics at Massachusetts Institute of Technology. Sara Seager is a leading exoplanet scientist who, among other things, is working on the problem of how to identify bio signatures in exoplanet atmospheres. The Space Telescope Science Institute is an astronomical research center as well as the mission operations center for the Hubble Space Telescope and NASA's planet-hunting Kepler telescope. Following the news conference, the five scientists will participate in a Reddit Ask Me Anything (AMA) session at 3 p.m. EST (2000 GMT), in which members of the public can pose questions to the scientists via a Reddit message board. 'Discovery beyond our solar system': is Nasa about to announce the it has found alien life? The content of today’s “major announcement” at Nasa remains shrouded in mystery, save for one tantalising detail. The agency has said its press conference will reveal details of “exoplanets”, planets which orbit stars other than the sun. These are significant because they are the major hope for discovering life beyond planet Earth, and scientists focus particularly on those a similar distance from their star as Earth is from the sun. Nasa’s announcement could, of course, be the discovery of alien life. But if it is not, the most significant detail may be the extent to which the new planet or planets have the conditions favourable for life, which would make them the focus of more intense study by astronomers. The most significant detail in this respect is whether or not the new planet or planets include liquid water, the principal ingredient for life. “One of the great questions of all time is whether we are alone in the universe," Paul Hertz, director of the Astrophysics Division at Nasa's headquarters in Washington, said at the time. “We live in a time when humanity can answer this question scientifically. And the first sign of answering this question is looking at exoplanets," he said. Nasa has so far analysed dozens of planets that orbit sun-like stars at similar distances as the earth to the sun. At a press conference earlier this year the organisation announced it had discovered 1,284 new planets, nine of which were in the "habitable zone". 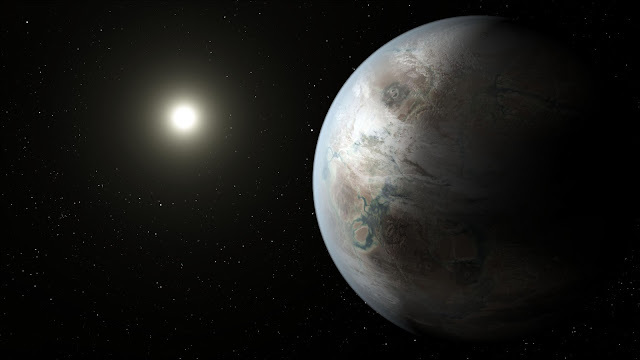 The first earth-like planet to be discovered was, Kepler-186f, a rocky planet that lies within the so-called "habitable zone" and is similar in size to earth. The Kepler space telescope has now located many more such planets. A MYSTERIOUS NASA tweet has prompted wild theories about whether humans have finally gotten in touch with aliens. In a tweet posted this morning, the space agency said it will make an announcement tomorrow about a “discovery beyond our solar system”. It didn’t offer much more detail, other than to say it is specifically related to “planets that orbit stars other than our sun, known as exoplanets”. But as vague as this preview is, it hasn’t stopped people from launching into conspiracy mode about whether a real-life ET situation is about to unfold. 0 Response to "NASA to Unveil New Exoplanet Discovery Tomorrow"